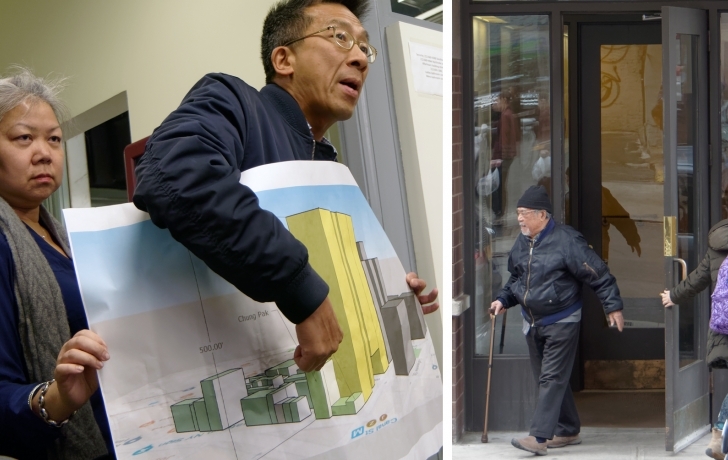 From a top floor terrace of Chung Pak, the 88-unit low-income senior housing building at 96 Baxter St., executive director Charles Lai was pointing to the Manhattan Detention Complex next door at 125 White St. There, he said, lay his fears for the future of his residents. If the city has its way, the jail next door and the one connected to it at 124 White Street will be torn down. In their place a mammoth 450-foot jail tower will rise, part of the de Blasio administration’s plan to close Rikers Island and build jails in all the boroughs except Staten Island. The expected eight months of demolition and years of construction has Lai and other Chinatown opponents of the plan saying that the health of the elderly residents are at stake. Administration officials insist that anything short of closing Rikers and building the four borough-based jails would fail to achieve the goal, set by the independent commission to close Rikers Island, of eliminating the isolation that makes visits to detainees by family members and lawyers difficult. And in Manhattan, they say, it only makes sense to build the jail in the same location as the current one, next to the Criminal Court building at 100 Centre St. The plan is being fought in all four boroughs. Many opponents argue that a modern facility could be built on Rikers Island far less costly than the minimum $11 billion projected for the four new buildings, and they say it could be made accessible with ferries and other added transportation. They also question whether the current jail population of about 8,000 can be further brought down—and kept down—to the projected goal of 5,000 citywide. Along with its 104 residents, the Chung Pak complex also houses a community health clinic and daycare center that Lai and others say would be impacted by the construction. Twelve small retail businesses on the block pay rent to Chung Pak’s parent organization, five of them are located on the ground floor of the jail that would be demolished. Opponents of the jail plan say many Chinatown businesses are already struggling, and the lengthy construction, projected for completion in 2027, will only make their problems worse. The public review process for the jail plan begins next month with Community Board 1 and continues before the Manhattan Borough President, City Planning Commission and City Council. CB1’s Land Use, Zoning and Economic Development Committee is expected to review the plan on April 8 and vote on a resolution on May 13 before it goes to the full board later in the month.